Not so Fara-way! Tucked within a fancy Williamsburg food court, the new Di Fara outpost boasts all the time tested recipes in an easy to get to location and, most importantly, no line! Few would argue that the original Midwood, Brooklyn Di Fara serves one of the best slices in the city. The debates typically surround the distance one must travel to get there to then wait in a lengthy line only to get a slice that you might have to eat standing up. With the recent opening within the North 3rd Street Market, the DeMarco family have proven that they are listening to and are hearing our pizza-loving demands. Although the new location lacks the physical presence of the legendary Dom DeMarco, the high quality ingredients and technique are there in spirit! I recommend the round cheese. There is no need to add toppings because the basic components of a Di Fara slice are all the toppings you need. Beginning with the uniformly thin-yet-sturdy crust, a heaping helping of chunky tomato sauce is added to provide a savory and subtle kick. Then, the pizza maker adds a blend of low moisture and fresh mozzarellas, hand-grated Parmigiano Reggiano and grana padano cheeses before placing it in a standard deck oven. But even when it's done baking, it's not done yet. Once it exits the oven, freshly scissored basil and a generous olive oil drizzle is applied punctuating a characteristic Di Fara slice. The reason why slices here are more expensive than anywhere else is simply because they're better. If you're looking for a discount, purchase a whole pie. 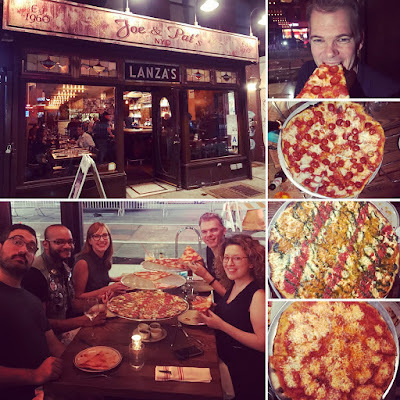 Enjoy it in the cafeteria style communal dining area surrounded by other boutique coffee and dessert shops knowing that you are eating a slice of Di Fara pizza, one of the best in the city. 1. Pilar Rau, Alyssa See, William Nunez and I had just finished a softball game at McCarren Park. We're on a team called Down to Field or "DTF" for short. We won the game so the post game pizza party proved that we might get older but we'll never grow up. 2. Pilar played catcher and I pitched. She only picked up softball a few years ago but seems to find herself on championship teams more often than not. I hope that doesn't change now that I'm on her team. 3. Alyssa See is one of the captains of our team. She also turned three double plays today at second base. She is from Ohio and came to NYC already loving pizza only to discover the wonder that is New York pizza. 4. William Nunez plays left field for our team and has a great swing and amazing base running skills. He is from the NYC area and just assumed that pizza is always good. 5. Jonathan Weiss has one of the most unique abilities I have ever seen. If you say the name of any movie, he will immediately tell you the year it came out. It's ridiculous. Movies from 1970-2000 are his wheelhouse. 6. I changed my phone phone background to this publicity shot of my wife as Trudy Carmichael ahead of her upcoming Fringe NYC show. If you want to see her live, book your ticket now at her website (link here). 7. We were the last game of the day. I volunteered to be the guy that schlepped the bases and forgotten equipment to shed.